Print your logo onto these custom printed custom short chiffon sarongs or one of our other innovative event clothing and use them in your next marketing campaign as a unique giveaway item. 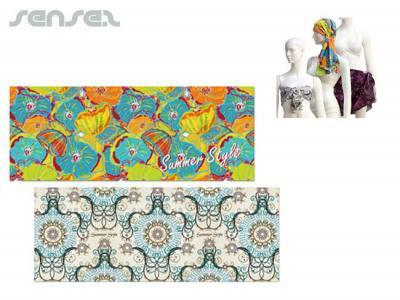 These custom full colour sublimation printed short sarongs are multi-purpose- use as a head scarf, around your waist or as a mini skirt sarongs are ideal for the beach and give you great branding opportunity at events. The lightweight Stretch French Velvet Chiffon polyester gives makes the fabric comfortable- made of 96% Polyester + 4% Spandex (Stretch French Velvet Chiffon) These Chiffon Sarong Scarves are great for team support or staff branding. We can also do larger size sarongs. Custom brand these cardboard sun visors or one of our best-selling promotional event giveaways»event clothing with your company logo! Personalise your custom short chiffon sarongs or custom design event clothing for your marketing campaign. How can these unique promotional custom short chiffon sarongs or our personalised event clothing fit in with your marketing strategy and help you maximise your brand exposure? Our custom made Custom Short Chiffon Sarongs can be produced from a minimum quantity of 50 pieces. We can have your logo branded on these corporate Custom Short Chiffon Sarongs in Full Colour Digital Print. A setup fee of AU$180.00 will apply to make the film.